»Die Zauberflöte« is by far the most famous of Wolfgang Amadeus Mozart’s operas. It is also the most enigmatic. At the start of the opera, Prince Tamino is saved at the last moment from a giant serpent by three women. They show him a picture of Pamina, who he instantly falls in love with. Together with the happy-go-lucky bird-catcher Papageno, he sets off on a journey to find his love, who (as he discovers) is in the clutches of the sun priest Sarastro. Tamino and Papageno have to pass various trials in order to prove themselves worthy of the women that they love. Eventually, Tamino and Pamina are accepted into the circle of initiates, the Queen of the Night is defeated and Papageno too finds his great love, Papagena. 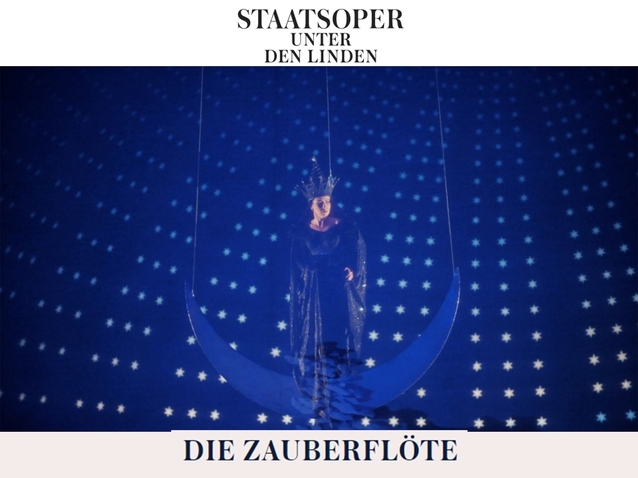 August Everding’s 1994 production is one of the all-time classics in the Staatsoper repertoire, featuring reconstructions of decorations designed by Karl Friedrich Schinkel in 1816 for the Berlin Court Opera on Unter den Linden – including the legendary »starry sky«.